Thank you all for being patient – we have been burning the candle at both ends; thus the tardy post. I began my Yoga Teacher Training and you can follow my journal here. We made this chutney a few weeks ago in anticipation of fall, and have made it a few times since. It really is very easy to make and quite tasty. Fold all ingredients together and chill for about an hour or two in the refrigerator. We love pairing this with pork, especially pork chops. It’s refreshing and light; this also works well with fatty white fish and lamb. What is your favorite protein combo? We are going to try this with our turkey this Thanksgiving. 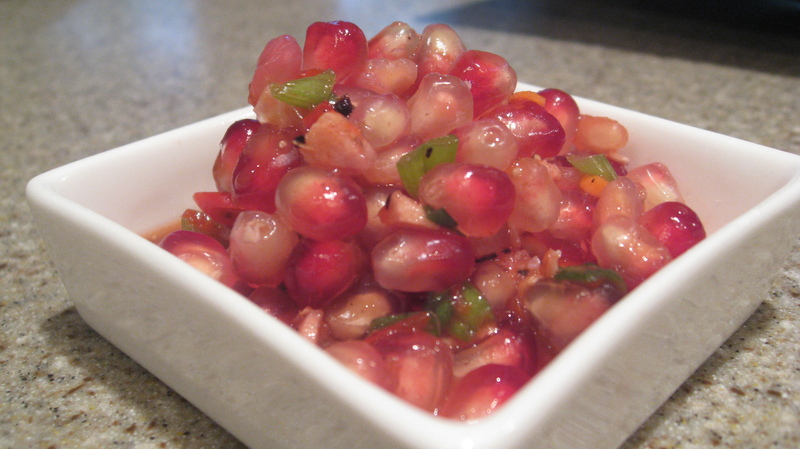 The pomegranate chutney looks good. Last week I had a pomegranate for the first time in several years and it was pretty good. I’ll have to give this a try. YUM YUM YUM! This sounds awesome Jo, and the kids absolutely love pomegranate. We can’t wait to try it. Can you tell me more about coconut vinegar? Thanks!